VAN VLECK, TEXAS – This November, voters in Van Vleck ISD will decide if the district will receive a $88.2 million bond it is requesting for a new elementary school; new middle school; new high school; renovations to the existing gymnasium, auditorium and Ag barn; improvements to the district stadium; and eight new school buses. Van Vleck ISD hosted public town hall meetings on September 11, September 25 and October 2 to inform district voters about the 2017 Bond and address any questions or concerns. Superintendent John O’Brien and other district officials will be hosting two additional town hall meetings on October 8 at the Cedar Lane Community Center and October 23 at Van Vleck High School. According to O’Brien, the main purpose behind the 2017 Bond is to address aging facilities; the average age of the VVISD school buildings is 57 years old. According to district records, maintenance costs have almost doubled over the past five years. O’Brien said beyond maintenance issues, old building present numerous challenges academically. When asked about the timing of the bond election, O’Brien said the recent influx of industry into the district influenced the decision largely, as that industry would take a significant portion of the bond responsibility off of VVISD homeowners. Estimates show that local industry will pay for 69% of the 2017 Bond, equaling almost $61 million of the $88.2 million bond total. If approved, it is estimated that the 2017 Bond would result in a tax rate increase of no more than 40.71 cents, equaling $305.33 per year for the average VVISD taxpayer with a $125,000 home valuation (after state and local homestead exemptions), or roughly 85 cents per day. Senior citizens 65 years of age or older with a homestead exemption will not experience a tax increase as a result of this bond election. In addition to the public town hall meetings, O’Brien said the district has developed many informational materials about the bond, including a website where all informational resources can be downloaded, www.VVbond2017.com. He also said his door is always open to anyone who would like to find out more about the bond or tour the existing district facilities. As Superintendent, O’Brien cannot advocate for or against the bond, but he did encourage VVISD taxpayers to exercise their right to vote. “I hope that VVISD voters will spread the word about this important election for our district and take the time to vote during Early Voting or on Election Day,” he said. The mission of the Van Vleck Independent School District, through a solidified partnership with the community, is to innovatively challenge each student to achieve maximum potential and success in a positive, safe, and stimulating environment. 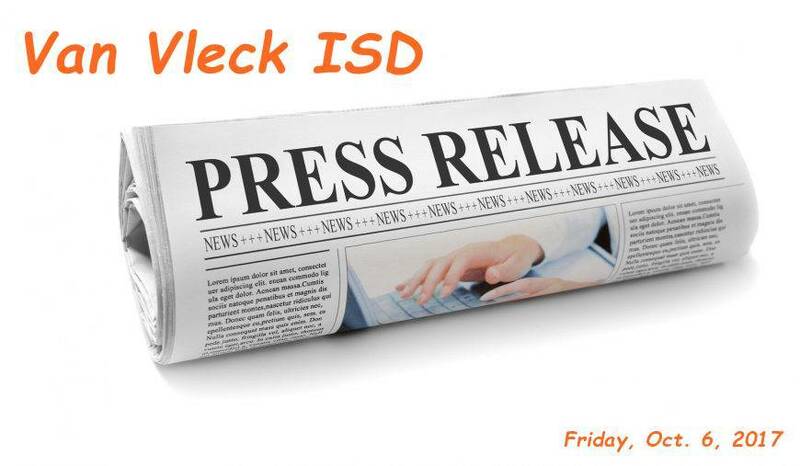 Van Vleck ISD and all campuses met the state’s standard for student performance in the 2016-2017 school year.